When I switch from a bust on the left to a bust on the right with a different graphic, there’s a split second where you can see the image changing. Is there any workaround other than using the wait command between messages? 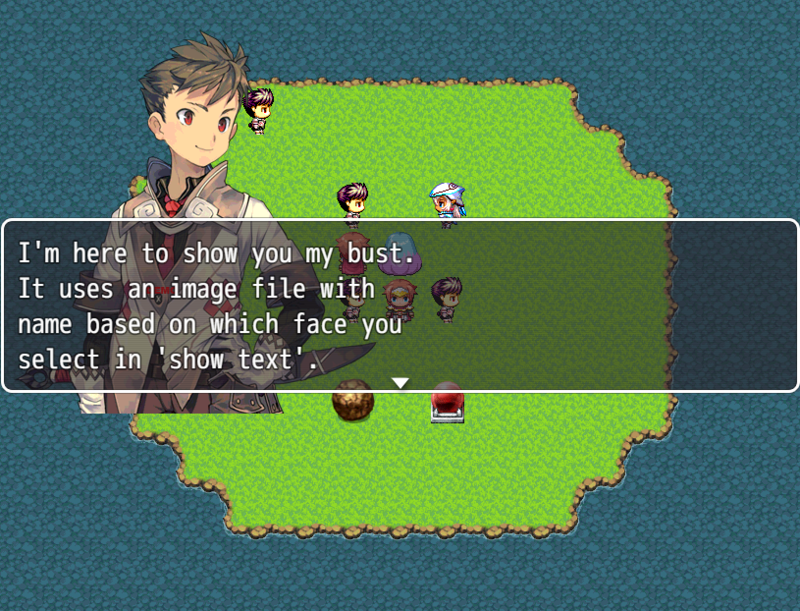 This has to do with how rpgmaker caches images as they are needed. You will need to look into pre loading your bust images before you use them in that manner for that issue to disappear. I know others have written plugins to do things like that, however I have not tried them. Thank you so much~ Been waiting for this one since day 1! I can’t seem to set the bust positioning to be above the message window, though. Could this be a bug? Another question, how come the busts doesn’t change to a different image when it’s supposed to? Could it be some plugin compatibility issue? Perhaps – did you try the demo? Just tested the demo, I think it works fine if there is a wait command before changing the bust, but without it the picture won’t change. Yeah, just tested it seems to be a bug when “Bust Priority” is set to 1. Change both settings to be “0” for it to work and I’ll fix that bug up – thanks for letting me know. V1.4 added escape codes to change bust mid message. Whoa dude! Thank you so much! So is there any way to have two busts on the screen during one text message? Or three, even? Is there (or will there be) a way to move the busts to the right side of the window? Yeah, if you read the plugin help file it tells you how to do it :) You view the help file via the plugin manager. So is the maximum number of character busts 8? Or 8 per face set? I’m hoping it’s the second and not the first lol. I imagine you get annoyed with us lol when we do this. Thx I’ll reread the help thing and look at the actual folders to figure it out. I think my last comment wasn’t uploaded, i’ll try to send another one. Sorry if it turns out to be doubleposting. So this plugin has a lag. When you using a new image for a bust wich isn’t used in a particiar game session yet, you can see a little delay before picture appears. 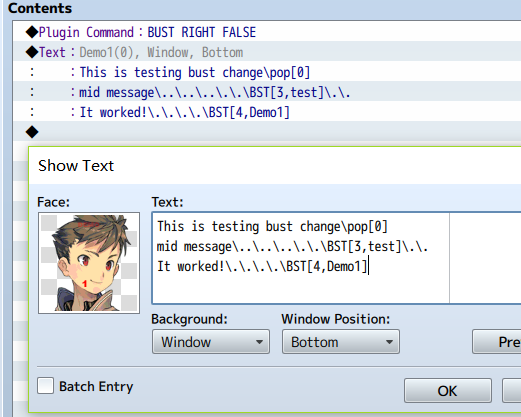 It’s easily to notice in your demo when a bust picture changes at the middle of text (through \BST[2,test] command). We never get this on Ace and it’s actually MV’s lag. But it can be fixed with “TDDP_PreloadManager” plugin, wich is part of DLC so it can be count as official, i guess. The plugin can be set to preload a certain PNG images to made a game runs more smoothley if we call those images by events. But “MV Message Busts” ignoring it and causes lags anyway. I has about 25 different busts per character for a wide range of emotions and this lag is very noticable for a games like mine. Please can you fix it? Or maybe give me a tip what to do to prevend those delays? I believe I mentioned this lag in the plugin help file. As you said, it is MV causing image loading lag and this allows people to play while images still load. I assumed TDDP Proload Manager would work with it as the images are called from the same cache – I will have to look at why it doesn’t work when I can. Welp, thank you for taking your time to look into this, anyway. Yes, there is no word wrapping so you need to do it normally, just like you would ending a line in the message. Updated to 1.7 – fixed the flicker/lag issue with changing bust graphics mid-message. Added a way to append a string to filename so you aren’t forced to use the same picture for both my Bust Menu and this Message Bust plugin. You can now use different images. Hi Galv love ur work. Found out that BUST FALSE will not work without a WAIT command before it. Also, must wait 10 frames at least. If not, there will be a semi transparent version of the bust remaining behind. 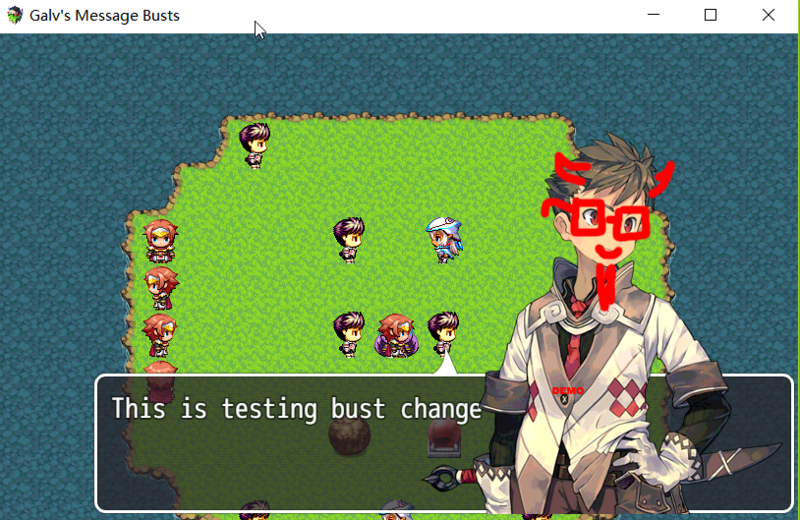 But if you put BUST FALSE at the beginning of an event, it works fine. Something to do with the speed of the bust fading away during BUST FALSE command. Is there a way to use the bust of someone who isn’t a party member? Really? I looked and could only find ways the get the party to show up. Which face image file would you use for say an store npc? Yes, really. The busts are based off of face images that you choose in a “Show Message” box. The default functionality is you can choose ANY face images you have available in your /faces/ folder for the message – nothing related to party members whatsoever. If you did it right, it could be a plugin conflict you need to test for. Is it possible to show 2 busts at the same time during messages? This plugin uses the face from the message box and there’s only one of those. You could use “Show Picture”. Need some help! Having problem when using with MV Message Styles, i want to use window2.png but when i set to MV Message Styles, MV Message Busts window also change! The message styles windowskin changes all message windows. The message busts dont have their own window. I had a quick look at Soulpour’s code and he has an error in it stopping other plugin commands working. You’ll need to ask him instead if you want to use both. Will you do a busts generator ? If no, have you any advices how to make busts manually ? I have a question. Can I change the name of partymember.png , and does it work only for busts, or it also can show faces ? I’m not sure why you’d want to, but in theory, you could open the .js file manually and go to line 205 and change ‘PartyMember’ to whatever you want. Is it possible to set a bust to show up in the center, as opposed to left or right? Currently I’m using oversized images with a lot of blank space. Also, is there a way to change which folder it pulls the images from? I’d kind of like to have a subfolder if possible. No worries boss, thanks for the quick reply! In my current project, I’ll only ever need the busts in the center. Would you mind pointing me in the direction of where the plugin calculates the position? I’ve been scanning the code up and down, trying different things, but none of my changes appear to work. I totally understand though if you don’t have the time, or you don’t want me derping around in your code. You’d have to change a few places if you wanted it to work in plugin command and everything. It’s on my to-do list but not any time soon as. Unfortunately I cannot help with just that info. I have provided a demo you could examine to see if you’ve done something different. Hi. Would there be any compatibility issues with Yanfly’s message system? I don’t think so. But it’s best to test that yourself. Do you have 5 pixel blank space in your busts? Or is your windowskin smaller than the window? My Windowskin is a bit smaller than normal. Can i change something in the script to customize it for me? What exactly does “file append” do? The demo doesn’t use it ans the only video on youtube doesn’t seem to use it either. Everytime I follow the demo rules and try to test it out the file name says “cannot load insert file name here.png” and then it freezes. If you say “Bust False” and save the game and load the savefile, then the command “Bust False” is not activ and crashes the game, if the next person has no bust. Mabye you can programm, that the game takes the face set, if no picture with the right name is in the picture folder and the “bust true” command is activ. Only an idea, if its possible. Updated to 2.6 to make the settings save in a saved game. I’m not having it check for existing images at this point in time as I am too busy, sorry. It works now very good :) Thanks galv! I have a question. I use mbs zoom script for my game. It works pretty with your cam. The mbs zoom script have a function to scale the pictures if you zoom in or out if you write [Zoom] in the picture file name. That works but the message busts dont zoom. Normal pictures will do it. Can you tell me if this problem is at your or at the zoom script? 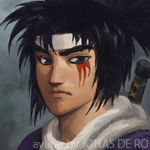 The zoom plugin changes how things are drawn and most of my plugins are not compatible with it. The cam plugin is because it had code in there specifically for it. I do not have plans to do this plugin, sorry. Yes, thanks :) This is my threat ;) very attentive! I have just downloaded this and I went to test it on my game when I go talk to one character she comes up correctly with a bust shot and the messages go through fine. But once I end that conversation and go to another character I get a type error that says undefined is not a function what am I doing wrong? Hi, Galv. I dig the plugin, but the bust doesn’t fix to the bottom of the screen when I set the value to 1. I have it below Yanfly’s Message Core, and I don’t think any other plugins I have interfere with it at all. Any ideas? You’ll have to check if any other plugins are conflicting and test if it happens in the demo. It doesn’t work in the demo, either, as far as I can tell. If the bust priority is 0 and bust position is set to 1, the bust will draw behind the text window instead of at the bottom of the screen. Priority 0 means bust will appear behind the window. Position 1 means the bust will sit at the bottom of the screen. This does work in the demo, so I am confused what you are trying to do. How do you want the busts to display? I was hoping I could get the bust to sit at the bottom of the screen when you call a text window in the center, but it keeps drawing the bust at the bottom of the dialog instead. Ahh I see, displaying message centered. Unfortunately I set that up to display at bottom of message box and that would have to be changed in script. I don’t have time to change this anytime soon, sorry. I know this is obvious, but I have never used script commands to change a parameter before. How can I change bustpriority to 1? You cannot use script command to change the bust priority in this plugin. You set it in the plugin settings. Thanks, but actually I already adjusted the offset in the png (because I want only the very bottom of the bust to overlap with the very top of the message window – sorry I didn’t make that clear). So right now the very bottom of the bust is behind the message window. I’m not sure what to do besides set bust priority to 1 in the plugin settings. Now my only question is: Is there a way to remove the fade-in and fade-out animation (so the bust just pops in and out)? If it’s not a setting in the plugin then I didn’t include a way to change that, sorry. Okay, I thought there might be a way by editing the code in the plugin itself, but I don’t know how these things work. Maybe I can change settings elsewhere. anyway, thanks again! Hi Galv, love your work! I use wait between messages but by using wait I can’t effectively fast forward my dialogues (with YEP MessageCore). Is there anyway I can fix it? Apparently NaN means “not a number.” Is the script considering the whole line the bust number? Do you how to prevent it from doing this? Thanks again for the great plugin! \iw isn’t a default text code – you must be using another plugin for that. I have tested this using default text commands and it works so it could be plugin conflict. Try putting this plugin below the other one in the plugin list. You’re right, it’s part of Yanfly’s Message Core. I tried putting your plugin and Message Core before and after each other in the plugin list, but it doesn’t seem to make a difference either way. I need to use both plugins, so I guess I’ll just make sure never to change busts and display icons on the same line, heh. One day when I have time I’ll try to work out why it happens. Super busy for a while, though, so not sure when. Hello, Galv. [Text X Offset] Is there a way to reverse this function? I also thought of this, but it didn’t seem to be as I expected it to be. Oh, you want the text to wrap. This plugin does not do text wrapping, you need to do your line breaks manually. sorry galv.I seem to have encountered a small problem. so which folder do i put it in? i’ma wanting to try a visual novel so ya. There’s instructions at the top and a demo I recommend checking out to see an example of how it works. Is it possible to vary from bust to regular facesets at times? Or does it force you to use only bust images in your project? Nevermind, I see now in your demo that it is possible.